For the first time, researchers have used brain imaging to measure synaptic loss in the brains of living people, perhaps providing a new way to study Alzheimer’s disease. Synaptic loss has been associated with cognitive impairment in Alzheimer’s disease. The findings of the NIA-supported study were published online July 16 in JAMA Neurology. In an exploratory study, researchers at Yale University and the Yale Alzheimer’s Disease Research Center used brain neuroimaging with positron emission tomography (PET), to measure a specific protein, SV2A, found in synaptic terminals. 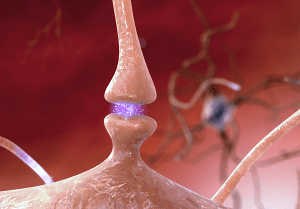 Neurotransmitter chemicals released from synaptic terminals of one brain neuron, cross a narrow gap (the synapse), and cause the adjacent neuron to turn on or off. Levels of SV2A protein should reflect the density of synapses; however, until this work, measurements of SV2A or synaptic density were only possible in brains of people after they died. The study involved 10 participants with either mild cognitive impairment (MCI) or mild Alzheimer’s disease who were compared with 11 participants who were cognitively unimpaired (average age, 73). The PET scans showed that people with MCI or mild Alzheimer’s disease had significantly less SV2A binding in the hippocampus, indicating a decrease in synaptic density, compared to cognitively normal participants. The hippocampus is part of the brain essential in forming memories and the location of early damage associated with Alzheimer’s disease. The PET scan results also correlated with test scores of episodic memory (memories of recent events), as well as scores on a cognitive test for Alzheimer’s disease. In comparison, some other brain imaging measures, though they detect proteins related to Alzheimer’s disease, do not correlate directly with cognitive function. According to an accompanying editorial by Elizabeth Mormino, Ph.D., from the Stanford Alzheimer’s Disease Research Center and William Jagust, M.D., from the University of California, Berkeley, a reliable measure of synaptic density in living people would provide both a better measure of disease progression and could help objectively evaluate treatment response in clinical trials of disease-modifying drugs. Additionally, the authors note that the method might prove useful not only in Alzheimer’s disease, but also other neurodegenerative and psychiatric diseases.